Our goal is to pass on our knowledge in a way that is accessible and fun for students of different learning styles. Our tutors are accomplished experts who have worked hard to achieve in their fields. We want to share our study habits and excitement for the material to help students succeed. We hope to make learning a fun experience, so we will pair your student with a tutor who teaches how your student learns. 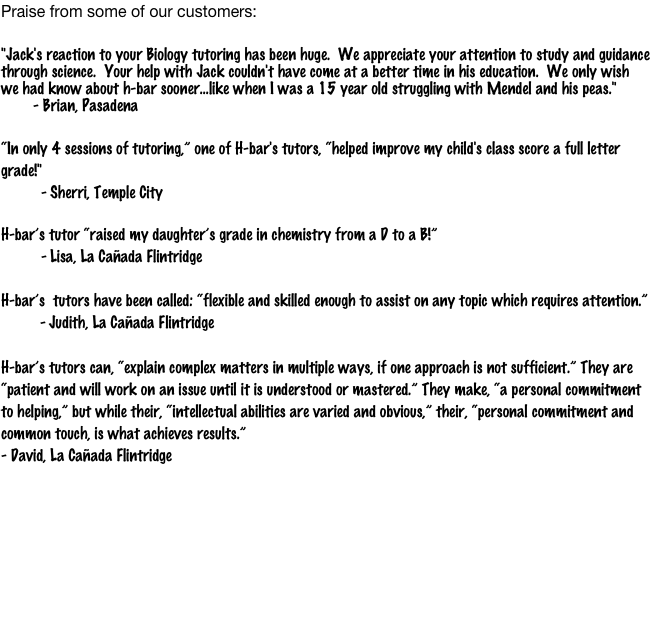 h-bar tutoring is a medium sized company providing service to North East Los Angeles and the San Gabriel Valley. Our company was started by Caltech graduate students, so naturally we specialize in math and science. We offer a wider range of services, including tutoring, small group classes, home-school mentorship, and standardized test preparation. h-bar was created to fill the need for an elite tutoring service that offered the best tutors. We know the importance of lasting relationships with inspirational tutors, and we are proud of ours. Call (626) 375 - 0575 to arrange your no-risk trial session: If you’re not happy after your first hour try a different tutor or get a full refund!